Benbrack W Top is the 678th highest place in Ireland. Unimpressive to look at but lovely views from top. Perhaps the dull rounded top put off previous summiteers from commenting, but the short climb is worth it as panoramic views of the Cuilcagh Mtns and Bellavally Gap are a sight to behold. If you follow walker_holick's directions on Bencroy, you can drive up to an unmarked single track road with some places to park at GR H 053 188 A and GR H 064 206 B. I left my car at the latter GR and following some recent rains, donned my wellies and headed North for the short but boggy and wet haul to the top. The joy of having dry feet after doing 4 of the Breifne tops, including wading through the peat to the trig on Slieve Anierin is worth the effort as they are my garden wellies, perhaps I should invest in a comfortable pair for hillwalking? 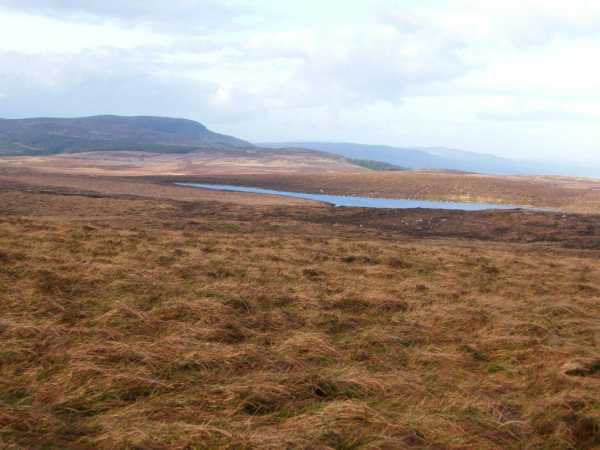 The top is featureless but excellent views overlooking the small Lough and surrounding hills. There was a small white marker stuck in a spot I thought wasn't the spot height marked on the map which I checked out anyway following the tracks (or rivers) of quad bikes.